At ATS Euromaster, we offer a great range of products and services at great prices. If you find the same product at a cheaper price, we’ll match it. Simply take note of the product, the price and the competitor, and we will verify and match the price for you. 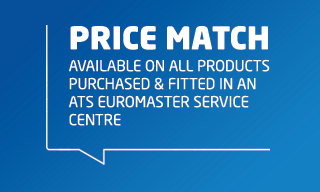 The price match is available on all products purchased and fitted in an ATS Euromaster Service Centre and must be applied at the time of purchase. The product must be identical (for tyres- manufacturer, pattern, size, speed rating and load rating: for non-tyre – manufacturer, specification and size). Please see below for full terms and conditions.